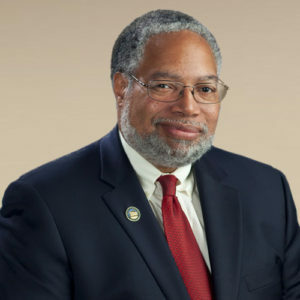 Lonnie Bunch is the Director of the Smithsonian Institution’s National Museum of African American History and Culture, which opened in 2016. Prior to his 2005 appointment to this post, he served as the president of the Chicago Historical Society, where he led a successful capital campaign to transform the Historical Society in celebration of its 150th anniversary; managed an institutional reorganization; initiated an unprecedented outreach initiative to diverse communities; and launched a much-lauded exhibition and program on teenage life titled “Teen Chicago.” He also held a number of positions, including Associate Director for Curatorial Affairs, at the National Museum of American History from 1989 through 2000. Mr. Bunch was the Program Manager and Curator of History for the California Afro-American Museum in Los Angeles from 1983 to 1989 and has taught at American University in Washington, D.C.; University of Massachusetts in Dartmouth, and George Washington University in Washington, D.C. He has served on the advisory boards of the American Association of Museums and the American Association of State and Local History. Among his many awards, he was appointed by President George W. Bush to the Commission for the Preservation of the White House in 2002. In 2005, Mr. Bunch was named one of the 100 most influential museum professionals of the 20th century by the American Association of Museums. Mr. Bunch received undergraduate and graduate degrees from American University in Washington, D.C.